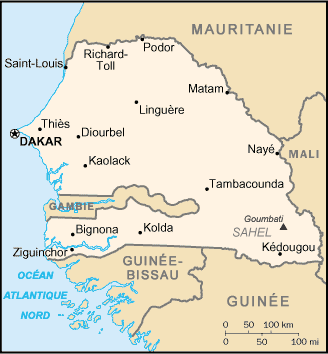 Senegal : When and where to go? The climate in Senegal divides the year into two principal parts: The dry season is from November to May with temperatures around 25°C, from June to October the rainy season controls the weather, it continues longer in the South than in the North. The month of June is generally wetter. Temperatures can reach 30°C during the wet season. It is more pleasant to visit Senegal during the wet season, and if possible before February, as temperatures are still warm, but the rainy season can also provide some beautiful moments with the flowering blossoms and the constant presence of the birds. Senegal is a perfect place for your first contact with Africa. Dakar, the capital city, will give you your first impressions, in particular when going through Sandaga Market. Visit the Théodore Monod African art museum, the big Mosque and in the evening wander around the town and absorb its musical atmosphere, do not forget to visit the fishing village of Soumbédioune in the east. The Casamance is a magnificent region, although fairly touristic, where you can easily find fairly cheap local style accommodation. Visit the crafts market of Zinguinchor and enjoy the fantastic beaches at Cap Skirring. To discover African wildlife, visit the Niokolo-Koba national park, there you can see protected antelopes, crocodiles, hippopotamus, and the last Senegalese elephants. Take a boat to visit the Island of Gorée and enjoy its peacefulness and its timeless charm, its houses with wrought iron balconies, the shady narrow streets and luxurious vegetation and a museum which movingly traces the history of the slave trade, it is named ‘The Slave House’. Finally, Saint Louis is a real paradise of calm due to its beautiful beaches, birds can be observed in the national park of Djoudj, and do visit its lagoons. No doubt a particular leitmotiv will accompany your holiday; the impish humor of the inhabitants. Dakar is very well served by numerous airlines. The budget to plan for is quite reasonable: A double room with breakfast will cost you around €25, and a good and copious meal can often be found for less than €10. Concerning health, it is recommended to have your usual vaccinations up to date, to which you should add those for yellow fever, typhoid and hepatitis A and B. The normal precautions for African countries should be taken: Wash your hands well, do not drink tap water, beware of raw fruit and vegetables and dairy products, and do not bathe in stagnant water. To travel within the country, mini-buses and bush taxis are frequent and fairly reliable. Going by bicycle is a possible solution given the flat landscape. In town, taxis are easy to find. One important point you should not forget, bargaining is a local tradition to be practiced without moderation!